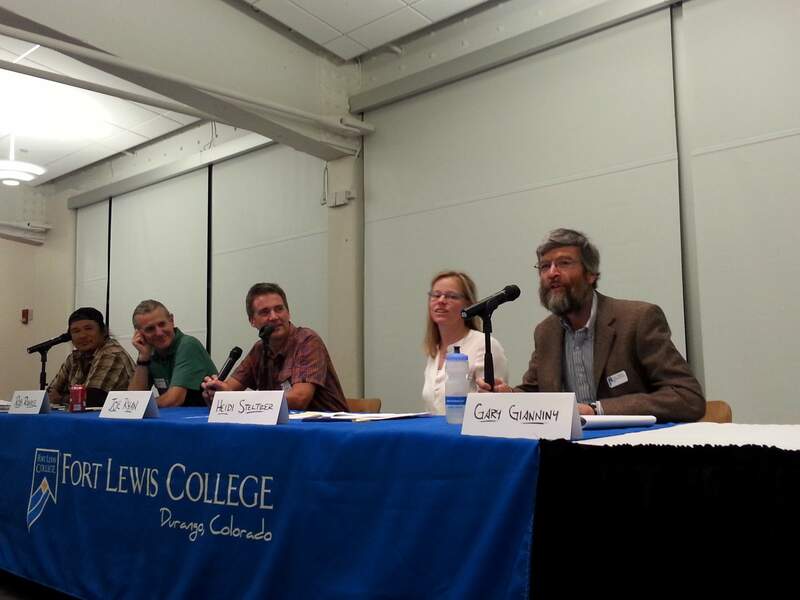 A panel of experts presented their findings about heavy metals in the Animas River System Friday at Fort Lewis College. The panel was held to include the community in the scientific analysis of mining pollution, and the crowd raised areas for further research during the question-and-answer session. Scientists working on heavy metals in the Animas River delivered some good news about the sediment Friday. Metals in the sediment left by the August Gold King Mine breach are likely to wash downstream without dissolving, and this could avoid a more toxic environment for aquatic life, a panel of experts said at Fort Lewis College. The perfect spring weather would bring flows of 6,000 to 7,000 cubic feet per second to the Animas River and wash much of metal-laden sediment downstream without bringing it up onto the banks. This would help remove the risk of metals dissolving, said Gary Gianniny, a professor at FLC who studies river sediment. “If they are not here, even if the pH changes, it doesn’t matter,” he said. Although some metals in the sediment from the Gold King Mine spill will wash away, heavy metals remain in the river because of the constant pollution from mines above Silverton, and the entire metal-rich environment needs to be understood better, said Heidi Steltzer a biology professor at FLC. Part of this ongoing monitoring means paying special attention to arsenic in the river because it is the most likely to dissolve and move through the river system, the panel agreed. “If you are going to watch for one element, watch for arsenic,” Gianniny said. What metals are in the soils and the types of plants near the river also deserves ongoing study, said Steltzer and Callie Cole, an FLC analytical chemistry professor. “We’re looking for a general understanding of this mountainous, metal-rich environment that we live in,” she said. Despite the metals, the river is safe for recreational use. Although the San Juan Health Department does advise washing with soap after playing in the water, said Brain Devine, an environmental health communications specialist.